We demonstrate that it is feasible to determine high-resolution protein structures by electron crystallography of three-dimensional crystals in an electron cryo-microscope (CryoEM). 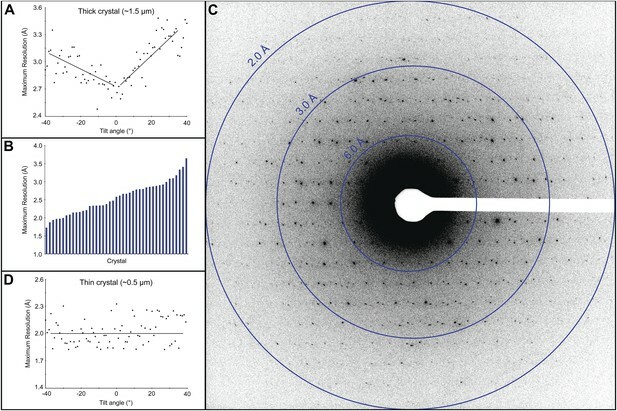 Lysozyme microcrystals were frozen on an electron microscopy grid, and electron diffraction data collected to 1.7 Å resolution. We developed a data collection protocol to collect a full-tilt series in electron diffraction to atomic resolution. A single tilt series contains up to 90 individual diffraction patterns collected from a single crystal with tilt angle increment of 0.1–1° and a total accumulated electron dose less than 10 electrons per angstrom squared. We indexed the data from three crystals and used them for structure determination of lysozyme by molecular replacement followed by crystallographic refinement to 2.9 Å resolution. This proof of principle paves the way for the implementation of a new technique, which we name ‘MicroED’, that may have wide applicability in structural biology. 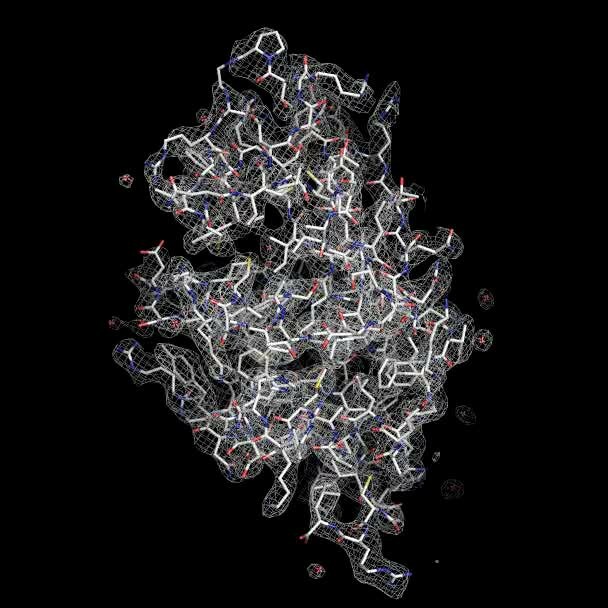 X-ray crystallography has been used to work out the atomic structure of a large number of proteins. 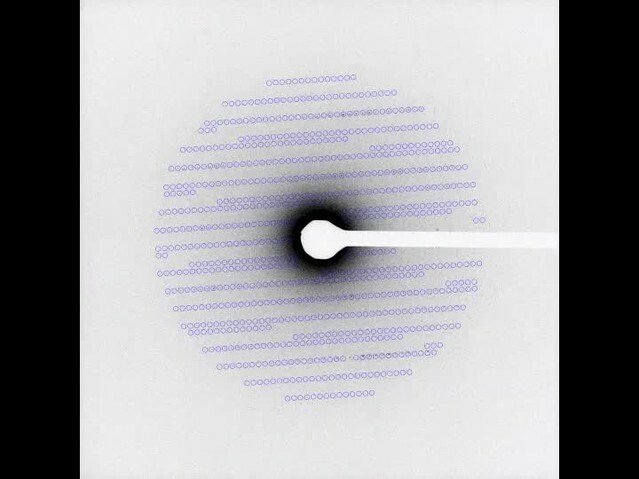 In a typical X-ray crystallography experiment, a beam of X-rays is directed at a protein crystal, which scatters some of the X-ray photons to produce a diffraction pattern. The crystal is then rotated through a small angle and another diffraction pattern is recorded. Finally, after this process has been repeated enough times, it is possible to work backwards from the diffraction patterns to figure out the structure of the protein. The crystals used for X-ray crystallography must be large to withstand the damage caused by repeated exposure to the X-ray beam. However, some proteins do not form crystals at all, and others only form small crystals. It is possible to overcome this problem by using extremely short pulses of X-rays, but this requires a very large number of small crystals and ultrashort X-ray pulses are only available at a handful of research centers around the world. There is, therefore, a need for other approaches that can determine the structure of proteins that only form small crystals. 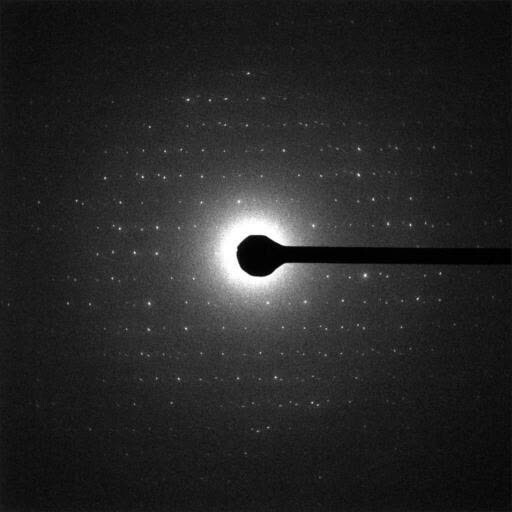 Electron crystallography is similar to X-ray crystallography in that a protein crystal scatters a beam to produce a diffraction pattern. However, the interactions between the electrons in the beam and the crystal are much stronger than those between the X-ray photons and the crystal. This means that meaningful amounts of data can be collected from much smaller crystals. However, it is normally only possible to collect one diffraction pattern from each crystal because of beam induced damage. Researchers have developed methods to merge the diffraction patterns produced by hundreds of small crystals, but to date these techniques have only worked with very thin two-dimensional crystals that contain only one layer of the protein of interest. Now Shi et al. report a new approach to electron crystallography that works with very small three-dimensional crystals. Called MicroED, this technique involves placing the crystal in a transmission electron cryo-microscope, which is a fairly standard piece of equipment in many laboratories. The normal ‘low-dose’ electron beam in one of these microscopes would normally damage the crystal after a single diffraction pattern had been collected. However, Shi et al. realized that it was possible to obtain diffraction patterns without severely damaging the crystal if they dramatically reduced the normal low-dose electron beam. By reducing the electron dose by a factor of 200, it was possible to collect up to 90 diffraction patterns from the same, very small, three-dimensional crystal, and then—similar to what happens in X-ray crystallography—work backwards to figure out the structure of the protein. Shi et al. demonstrated the feasibility of the MicroED approach by using it to determine the structure of lysozyme, which is widely used as a test protein in crystallography, with a resolution of 2.9 Å. This proof-of principle study paves the way for crystallographers to study protein that cannot be studied with existing techniques. X-ray crystallography depends on large and well-ordered crystals for diffraction studies. Crystals are solids composed of repeated structural motifs in a three-dimensional lattice (hereafter called ‘3D crystals’). The periodic structure of the crystalline solid acts as a diffraction grating to scatter the X-rays. For every elastic scattering event that contributes to a diffraction pattern there are ∼10 inelastic events that cause beam damage (Henderson, 1995). Therefore, large crystals are required to withstand the high levels of radiation damage received during data collection (Henderson, 1995). Despite the development of highly sophisticated robotics for crystal growth assays and the implementation of microfocus beamlines (Moukhametzianov et al., 2008), this important step remains a critical bottleneck. In an attempt to alleviate this problem, researchers have turned to femtosecond X-ray crystallography (Chapman et al., 2011; Boutet et al., 2012), in which a very intense pulse of X-rays yields coherent signal in a time shorter than the destructive response to deposited energy. While this technique shows great promise, the current implementation of the technology requires an extremely large number of crystals (millions) and access to sources is still in developmental stages. Electron crystallography is a bona fide method for determining protein structure from crystalline material but with important differences. The crystals that are used must be very thin (Henderson and Unwin, 1975; Henderson et al., 1990; Kuhlbrandt et al., 1994; Kimura et al., 1997). Because electrons interact with materials more strongly than X-rays (Henderson, 1995), electrons can yield meaningful data from relatively small and thin crystals. This technique has been used successfully to determine the structures of several proteins from thin two-dimensional crystals (2D crystals) (Wisedchaisri et al., 2011). High energy electrons result in a large amount of radiation damage to the sample, leading to loss in resolution and destruction of the crystalline material (Glaeser, 1971). As each crystal can usually yield only a single diffraction pattern, structure determination is only possible by merging data originating from hundreds of individual crystals. For example, electron diffraction data from more than 200 individual crystals were merged to generate a data set for aquaporin-0 at 1.9 Å resolution (Gonen et al., 2005). While electron crystallography has been successful with 2D crystals, previous attempts at using electron diffraction for structure determination from protein 3D crystals were not successful. A number of studies detail the difficulties associated with data collection and processing of diffraction data that originates from several hundreds of 3D crystals, limiting the ability to integrate and merge the data in order to determine a structure in such a way (Shi et al., 1998; Jiang et al., 2011). We show here that atomic resolution diffraction data can be collected from crystals with volumes up to six orders of magnitude smaller than those typically used for X-ray crystallography. The technique, which we call ‘MicroED’, uses equipment standard in most cryo-EM laboratories and facilities. We developed a strategy for data collection with extremely low electron dose and procedures for indexing and integrating reflections. We processed the diffraction data and determined the structure of lysozyme at 2.9 Å resolution. Thus, a high-resolution protein structure can be determined from electron diffraction of three-dimensional protein crystals in an electron microscope. Lysozyme was chosen as a model protein because it is a well-behaved and well-characterized protein that readily forms well-ordered crystals. From the time its structure was first analyzed (Blake et al., 1962, 1965), lysozyme has been a well-studied protein and the model protein of choice for many new methods in crystallography (Boutet et al., 2012; Cipriani et al., 2012; Nederlof et al., 2013). Small microcrystals of lysozyme were grown by slightly modifying the crystal growth conditions as detailed in the ‘Materials and methods’ section. 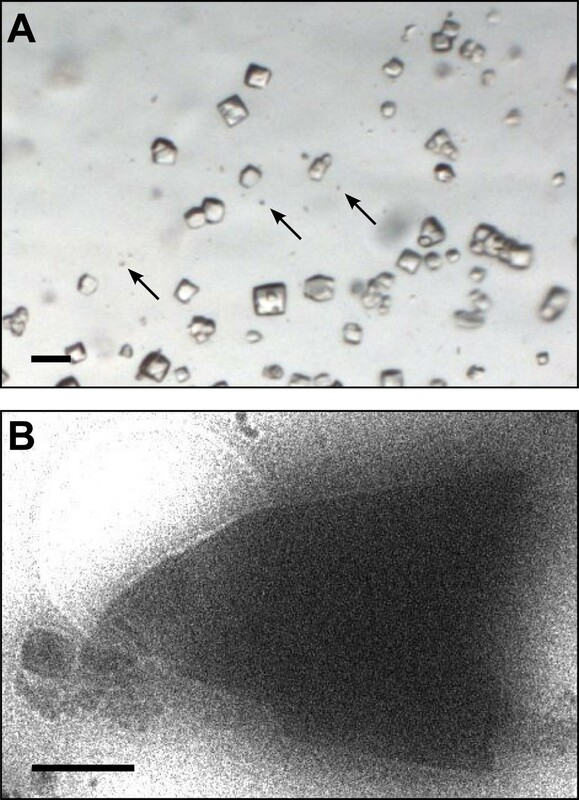 Figure 1A shows a typical crystallization drop containing microcrystals, which appear as barely visible specks (arrows) alongside the larger crystals that are typically used for X-ray crystallography. These specks are up to 6 orders of magnitude smaller in volume than the larger crystals in the drop. The solution containing these microcrystals was applied to an electron microscopy holey-carbon grid with a pipette and plunged into liquid ethane. The grids were then imaged using a 200 kV TEM under cryogenic conditions (Figure 1B). More than 100 microcrystals were typically observed per grid preparation, and these ranged in size from several microns to sub micron. The crystals typically appeared as electron dense rectangular or triangular forms with very sharp edges. (A) Light micrograph showing lysozyme microcrystals (three examples indicated by arrows) in comparison with larger crystals of the size normally used for X-ray crystallography. Scale bar is 50 μm. (B) Lysozyme microcrystals visualized in over-focused diffraction mode on the cryo-EM prior to data collection. The length and width of the crystals varied from 2 to 6 µm with an estimated thickness of ∼0.5–1 µm. Scale bar is 1 µm. Electron diffraction was used to assess the quality of the cryo-preparations. Crystals that appeared thick (estimated as >3 μm) did not yield diffraction data because the electron beam could not penetrate the sample. Crystals that appeared slightly thinner, estimated at ∼1.5 μm, did show diffraction, but because the quality of the pattern varied depending on the sample tilt (Figure 2A), we did not use crystals of this thickness and size for data collection. Approximately 50% of the crystals in our preparations appeared much thinner, estimated at ∼0.5 μm, and showed a distribution of attainable resolutions with the best diffracting to ∼1.7 Å resolution (Figure 2B,C). Generally, we were only able to obtain high quality diffraction data from the very thin crystals, ∼0.5–1 μm thick and 1–6 µm long and wide. While these crystals are exceptionally small, they still contain approximately 55 × 106 unit cells. Moreover, we found that for such thin crystals the tilt had no significant adverse affect on the diffraction quality (Figure 2D). Resolution and data quality of lysozyme microcrystals. (A) Analysis of the effects of crystal thickness on maximum resolution of observed reflections from thick crystals. The analysis shows adverse effects of crystal thickness on the obtainable resolution as large crystals are tilted. (B) For assessing the quality of our cryo preparations, diffraction data were obtained from 100 lysozyme microcrystals. 43/100 were thin crystals that showed reflections in the 2–4 Å range, with the best crystal in this set yielding data to ∼1.7 Å resolution. (C) An example of lysozyme diffraction data collected at 0.01e−/Å2/second and a 10 s exposure. The pattern shows strong and sharp spots surpassing 2 Å resolution. This diffraction pattern was processed with ImageJ and despeckled for ease of viewing. (D) Analysis of the effects of crystal thickness on maximum resolution of observed reflections from thin crystals. The small crystal shows a relatively constant maximum resolution that does not appear to be affected by crystal tilt. For 2D electron crystallography, the electron dose that is typically used in diffraction causes significant radiation damage to the sample, leading to a rapid loss in resolution and destruction of the crystal (Glaeser, 1971; Unwin and Henderson, 1975; Taylor and Glaeser, 1976). As a result, each crystal exposed to high dose usually only yields a single diffraction pattern, and structure determination requires the merging of data originating from a large number of individual crystals. However, 3D crystals can deliver electron diffraction data to atomic resolution with very low doses. A recent study documents ∼3 Å resolution diffraction data from catalase 3D crystals after a single exposure of less than 10e−/Å2 (Baker et al., 2010). We reasoned that one way to overcome the difficulties of indexing and merging data from hundreds of crystals is to collect a complete diffraction data set from a single crystal while keeping the total dose below ∼10e−/Å2. Because all the data would originate from a single crystal, indexing, integration and merging should be straightforward and structure determination possible. We used a sensitive CMOS based detector (Tietz Video and Image Processing Systems GmbH), previously shown to be beneficial for electron diffraction studies (Tani et al., 2009) and modified our data collection procedure. We found that even with extremely low electron dose of <0.01 e−/Å2 per second, we could record diffraction data from lysozyme microcrystals showing strong and sharp diffraction spots extending well beyond the 2 Å resolution mark (Figure 2C). As a dataset containing multiple exposures from a single crystal is collected, energy transferred by inelastic scattering will damage the crystalline matrix, negatively affecting both the resolution limit and intensities of observed reflections. Although the overall damage from electron scattering is much lower than that for X-rays (approximately 60 eV deposited per elastic scattering event vs 80 keV per elastic X-ray scattering event [Henderson, 1995]), accumulating radiation damage will eventually contribute significant error to the recorded intensities. We performed an experiment to quantify the effects of increasing electron dosage on recorded intensities (Figure 3). A single protein microcrystal was subjected to sequential 10 s exposures, each delivering ∼0.1 e−/Å2, until a total accumulated dose of ∼12 e−/Å2 was reached. The intensities of three diffraction spots, ranging from resolutions of 2.9 to 4.6 Å, were measured on each of the 120 resulting diffraction patterns and compared. There were no observable adverse effects on resolution (Figure 2D) or intensity until the accumulated dose had reached ∼9 e−/Å2 (Figure 3). We therefore optimized the data collection protocol to keep the total accumulated electron dosage below this critical value. Effects of cumulative electron dose on diffraction data quality. 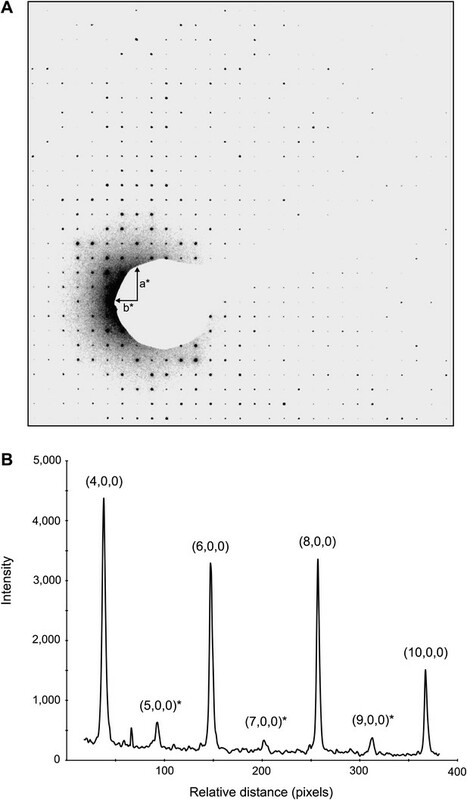 A single lysozyme microcrystal was subjected to 120 sequential exposures without tilting, each of a dose of ∼0.1 e−/Å2 for a total accumulated dose of ∼12 e−/Å2. Normalized intensity vs total accumulated dose for three diffraction spots observed over all 120 sequential frames was plotted. 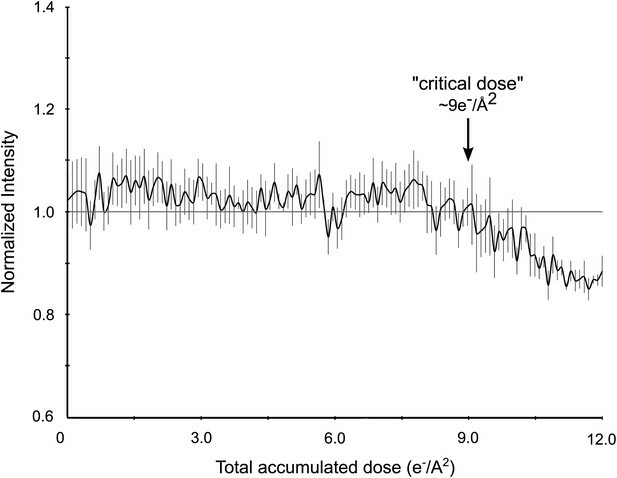 A decrease in diffraction intensity becomes apparent at a dosage of ∼9 e−/Å2 (‘critical dose’). Bars represent standard error of the mean. By using such a low dose, we could limit the radiation damage to the crystal, allowing us to collect multiple diffraction patterns from a single crystal instead of just a single pattern. Using this modified procedure, we were able to collect up to 90 individual diffraction patterns from a single crystal (Video 1). Each pattern was recorded following a 1° tilt to cover ∼40–90° (begin with the stage tilted at −45° and proceed to collect data to +45° in order to cover a 90° wedge). 0.1 and 0.2 degree increments were also applied to sample the reciprocal space at higher resolution. Each exposure lasted up to 10 s at a dosage of approximately 0.01 e−/Å2 per second, for a cumulative dose of no more than ∼9 e−/Å2 per data set. An example of a complete three-dimensional electron diffraction data set from a single lysozyme microcrystal. In this example, diffraction patterns were recorded at 1° intervals from a single crystal, tilted over 47°. Cumulative dose was ∼5 e−/Å2 in this example. The lattice parameters were determined and the lattice indexed with software based on previous studies (Shi et al., 1998). By collecting multiple frames from the same crystal, it was possible to determine the orientation and magnitude of the reciprocal unit cell vectors a*, b*, and c* as described in the ‘Materials and methods’ section. These vectors were calculated for each data set, allowing the prediction of the position of the reflections in each diffraction pattern (Figure 4; Video 2) and indexing of the entire data set. The unit cell dimensions were calculated as a = b = 77 Å, c = 37 Å, α = β = γ = 90° and P43212 symmetry. This space group symmetry and unit cell dimensions are consistent with previous lysozyme X-ray diffraction data (Diamond, 1974; Sauter et al., 2001; Cipriani et al., 2012). Prediction of reflections and indexing in the diffraction patterns. (A and B) Two examples of diffraction patterns obtained from a single crystal at tilt angles of 0° and 20° respectively. Locations indicated by circles were predicted to contain diffraction spots by our spot prediction algorithm. Additional examples from the same crystal are presented in Video 2. The resolution limit was set at 2.9 Å resolution for this study. An example of spot prediction in diffraction data from a single crystal. 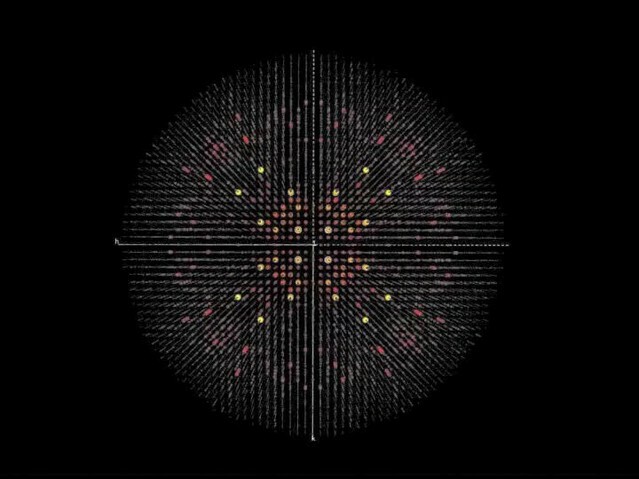 Reflections predicted on representative diffraction patterns obtained from a single crystal tilted over 39° sampled every 2° in this video. Predictions were made to 2.9 Å resolution using our spot prediction algorithm. The electron diffraction data were collected on a microscope operating at 200 kV and equipped with a field emission gun (FEG) electron source. The FEG can generate a very coherent beam with an energy-spread function of <1 eV at 200 kV acceleration voltage. The electron beam wavelength is 0.025 Å at 200 kV compared with ∼1 Å for X-rays. Under such conditions, the Ewald sphere in our experiments is nearly flat (the sphere is off the reciprocal plane by only 0.003 Å−1 at 2 Å resolution) even in the high-resolution range. Measurements of the full width at half maximum intensity for the strongest reflections indicate that the reflections in our experiments are very tight, spreading less than a 6 pixel sphere that corresponds to ∼1/1000 Å. (Figure 5) In our experiments, the shortest unit cell dimension for lysozyme in reciprocal space is a* = b* = 1/77 Å. Therefore, without beam oscillation or mechanical oscillation of the crystal (microscope compustage), the lattice points on a single projection that are not exactly at the Ewald sphere surface will give partial intensities. Three-dimensional profiles of the intensity of a single reflection over three consecutive diffraction patterns at −0.1°, 0°, and 0.1° degree tilts. The plots show the approximate dimensions of the full reflection with a width (full width at half maximum height) of 3–5 pixels in the x, y, and z direction. Because we densely sampled the reciprocal space, we recorded multiple observations for every lattice point (Table 1). Therefore, we could sample the observed intensity values for each reflection multiple times (multiplicity value = 34), and we made the assumption that the strongest intensity roughly approximated the complete intensity. Therefore, we kept only the maximum intensity and treated it as a unique reflection in the final structure factor file. All other recorded intensities were presumed to be partial reflections and were therefore discarded. The merging of data in P422 symmetry from three separate crystals processed in this manner resulted in a final data set with 2490 unique reflections with ∼92% cumulative completeness at 2.9 Å resolution (Table 1, Video 3). The measured intensities were converted to amplitudes by assuming Ihkl ≈ |Fhkl|2 (Drenth, 1994) and an mtz file generated. Multiplicity is defined as total measured reflections divided by number of unique reflections. Statistics given by PROCHECK (Laskowski et al., 1993). Three-dimensional representation of merged intensity values. 2490 total unique reflections are present for an overall completeness of 92% at 2.9 Å resolution. Video begins with a* axis horizontal, b* axis vertical, and the c* axis normal to the image plane. The structure of lysozyme was solved at 2.9 Å resolution by molecular replacement (MR) using the lysozyme PDB 4AXT (Cipriani et al., 2012) as a search model. The initial MR 2Fobs−Fcalc map prior to refinement is presented in Figure 6. The map shows well-defined density around the model, indicating high quality phases from MR (Figure 6A,B). Likewise, a composite-omit map that was calculated by omitting 5% at a time showed good agreement with the original map obtained by MR (Figure 6C). 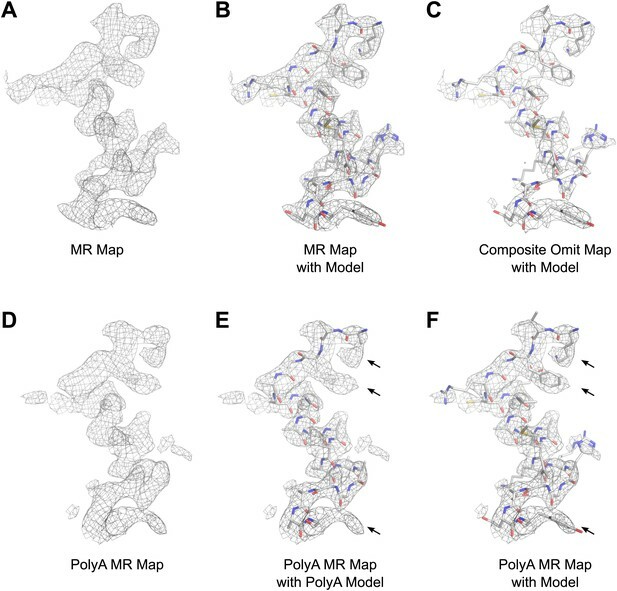 When a poly-alanine (polyA) model of lysozyme was used for MR, the resulting map showed significant density beyond the alanine side chains (indicated by arrows in Figure 6E,F), into which the correct side chains could be built. These results indicated that our solution from MR was not dominated by model bias. Results of phasing by molecular replacement prior to crystallographic refinement. 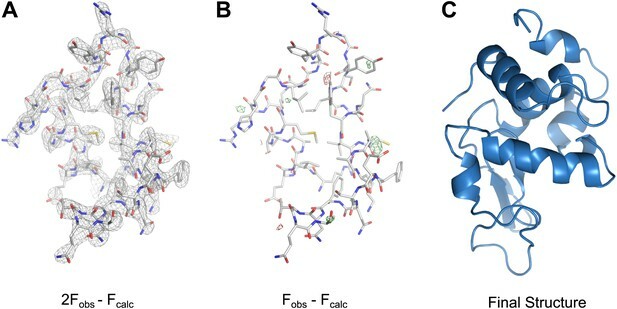 Molecular replacement was performed with both the full model of lysozyme (PDB 4AXT, top panels) as well as a poly-alanine model (bottom panels) and the resulting 2Fobs−Fcalc maps around residues 1–20 are shown. (A and B) The phases following molecular replacement with the full model were of good quality demonstrated by how well the density surrounding the model fits, even before any refinement is performed. (C) A composite-omit map calculated by omitting 5% at a time showed good agreement with the unrefined structure indicating the phases were not dominated by model bias. (D–F) As an additional test of model bias, phasing was done with a poly-alanine homology search model of lysozyme. The resulting 2Fobs−Fcalc map is of good quality (D) and shows density extending beyond the poly-alanine model (E and F, arrows). (F) The same density map as E but with the structure of lysozyme fit. Arrows in D and E show examples of clear side chain density from the poly-alanine map. All maps are contoured at 1.0σ. Following refinement that included the use of electron scattering factors, rigid body, simulated annealing, and B-factor refinement, a solution was found with acceptable statistics (Rwork/Rfree = 25.5%/27.8%) and good geometry at 2.9 Å resolution (Table 1). The density map obtained by electron diffraction shows good agreement with the refined model (Figure 7A, Video 4). The Fobs−Fcalc difference map shows no interpretable features (Figure 7B). Additionally, the final structure has a very low RMSD (0.475 Å for Cα, 0.575 Å for all atoms) when compared to the previously published high-resolution structure of lysozyme (Cipriani et al., 2012). MicroED structure of lysozyme at 2.9 Å resolution. (A) The 2Fobs−Fcalc (contoured at 1.5σ) map covers protein residues 5–45 of lysozyme. (B) Fobs−Fcalc difference map contoured at +3.0σ (green) and −3.0σ (red) for the same protein region. The map (A) shows well-defined density around the vast majority of side chains and the difference map (B) shows no large discrepancies between the observed data (Fobs) and the model (Fcalc). The final structure of lysozyme is shown in panel C and the complete three-dimensional map is presented in Video 3. 2Fobs−Fcalc density around the complete lysozyme model at 2.9 Å resolution (contoured at 1.5σ). All measured intensities were replaced with random numbers ranging between the minimum and maximum of the actual observed experimental values. The experimental intensity values were kept but the Miller indices were randomized. All experimental intensities were replaced with an actual intensity value that was measured by X-ray crystallography of an unrelated structure (Calmodulin PDB ID:3SUI [Lau et al., 2012]). Each experimental intensity was increased or decreased randomly by up to 35%. In addition, the correct experimental dataset was also used and labeled as dataset ‘5’. These five datasets were treated as ‘blind test cases’, in which the user did not know the identities of the various test datasets. Each test dataset was used for molecular replacement with the lysozyme model (Cipriani et al., 2012), followed by a single round of refinement in PHENIX (Adams et al., 2010). Only dataset 5, which contained the correct observed experimental intensities, yielded a solution that could be further refined to acceptable Rwork/Rfree and geometry. Datasets 1–4, which contained the random errors described above, either did not yield MR solutions or would not allow refinement to produce an acceptable structure (Table 2). Final Rfree after a minimum of two cycles of refinement. Solution was found; however, the space group was incorrect (P4121). 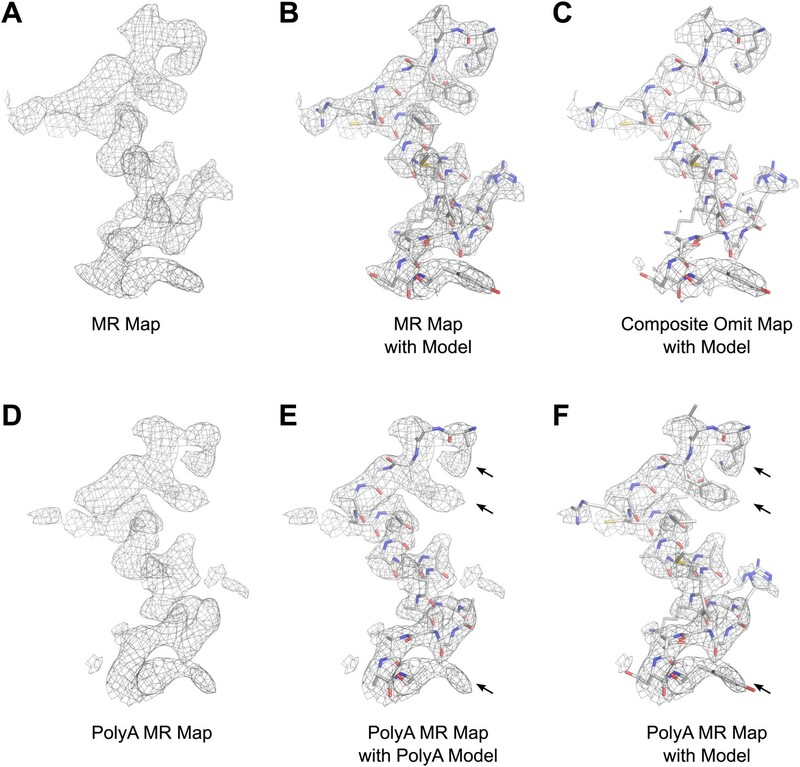 We also tested the robustness of the MR procedure by using a number of unrelated structures, chosen from the PDB for their similar unit cell dimensions and protein molecular weights, as search models against our experimental data. The unrelated structures were: T4 lysozyme, calmodulin, dodecin, and αA crystallin (Table 3). None of these structures gave an acceptable MR solution. Together, these experiments indicate that the extracted intensities are accurate enough to yield a reliable structure and that model bias originating from MR did not skew our results. Data sets collected in electron crystallography of 2D crystals suffer from a missing cone due to the limitation of the maximum achievable tilt angle in the TEM. Previous reports estimate that with tilt angles up to 60°, the missing cone is roughly 13% (Glaeser et al., 1989), and the resolution in plane is typically higher than the resolution perpendicular to the tilt axis (z*). In our experiments, because the data from 3 crystals were eventually used, and the orientation of each crystal on the grid varied, we could cover the full reciprocal space (Video 3). 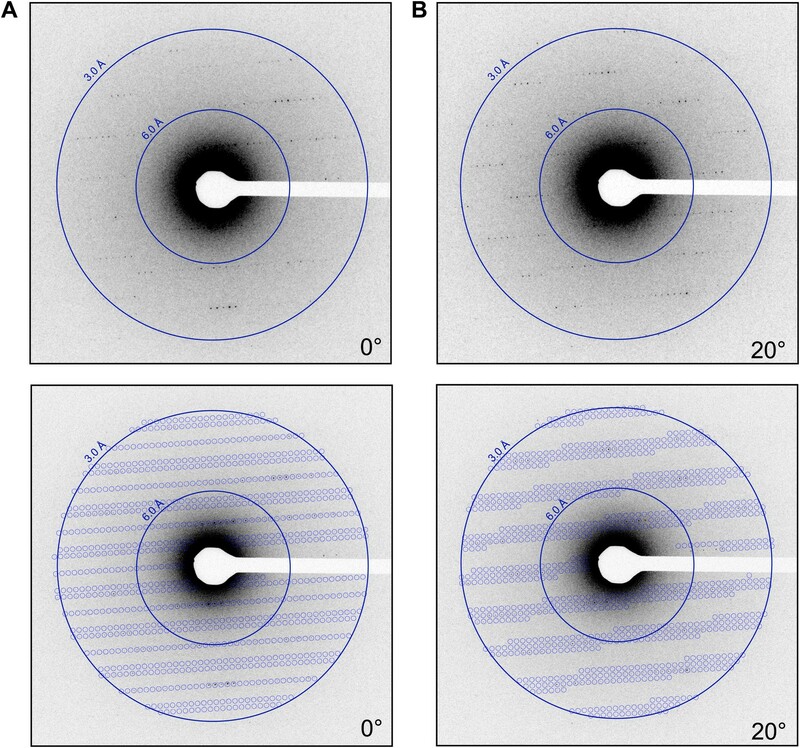 Dynamic scattering likely introduces inaccuracies in the electron diffraction data. In electron diffraction, dynamic scattering (multi scattering events) could redistribute primary reflection intensities, reducing the accuracy of the intensity measurements by randomly contributing to the observed intensities (Grigorieff et al., 1996). The lysozyme crystals have P43212, symmetry and systematic absences are expected at (2n+1,0,0). However, very weak reflections were observed at the positions where absences were expected (Figure 8). It is likely that these reflections originate from dynamic scattering events. We plotted the intensities along the a* and b* axes and compared the intensity values. The intensities of Miller indices (2n+1,0,0) and (0,2n+1,0) were measured and compared to the intensities of the four immediately adjacent reflections (2n+2,1,0), (2n+2,−1,0), (2n−2,1,0), and (2n−2,−1,0). On average, the intensity in the systematic absences was found to be 4.9% of the total intensity of the adjacent spots. (Standard deviation 2.7%, Max 12.4%, n = 17). Moreover, comparison of our experimental intensities with intensities obtained by X-ray diffraction of lysozyme of the same crystal form indicates that our data follow a similar trend and are not dominated by intensity randomness. A Pearson correlation coefficient between the two data sets was 0.63 from 6.0 to 13.5 Å (0.56 from 2.0–13.5 Å), indicating conservation of reflection hierarchy—strong intensities remain strong and weak intensities remain weak. Together, our analyses suggest that multiple scattering contributes at maximum roughly 10% to the intensity value and that at least for structure determination at 2.9 Å resolution such an error in intensity appears to be tolerable. It is possible that dynamic scattering will become a significant source of error at higher resolutions and some correction algorithm will then have to be developed. Dynamic scattering in lysozyme 3D crystals. Intensity measurement along the a* axis of a raw diffraction pattern illustrating the relatively small contributions due to dynamic scattering. (A) Diffraction pattern from the major plane of a lysozyme crystal with visible intensity in the (2n+1,0,0) and (0,2n+1,0) Miller indices. (B) (2n+1, 0, 0) reflections (starred) are expected to be systematically absent and observed intensities at these indices are assumed to be the result of dynamic scattering. Image contrast was enhanced for clarity using ImageJ. While our proof of principle is an important first step, further optimization of the method is required. Better programs need to be developed for accurately determining lattice parameters, indexing all reflections, extracting the intensities and correcting for incomplete intensities, dynamic scattering, and Ewald sphere curvature. Specifically, developing procedures for postrefinement (unit cell refinement, estimating the mosaic spread, rocking curve, etc) should allow for the proper correction and scaling of partially recorded reflections, leading to improved estimation of full intensities. Relatively minor modifications to existing programs such as MOSFLM (Leslie and Powell, 2007) should allow the handling of electron diffraction data from 3D crystals and take advantage of the large body of work already dedicated to processing X-ray diffraction data. The accuracy of the microscope compustage can be improved and procedures for crystal or beam oscillation implemented. Our method of using the maximum intensity measurement as an approximation of the full intensity of any given spot is admittedly crude, as it depends on the intersection of the Ewald sphere through the center of each spot at some point in the tilt series. As the resolution increases, this event becomes increasingly unlikely. Crystal oscillation or related methods such as precession of the electron beam (Gjønnes et al., 1998) would allow more accurate determination of spot intensities, especially at very high resolutions. Further development of various methods for phasing the diffraction data are also required and could possibly include heavy metal phasing. Such phasing methods are standard in X-ray crystallography and rely on differences in intensity values between a native data set and heavy metal derivative data sets. It is possible that in electron crystallography dynamic scattering could hinder phasing by such methods, and new algorithms will need to be developed to make this possible. Phase extension from projection maps or from low-resolution density maps can also be used for direct phasing (Gipson et al., 2011; Wisedchaisri and Gonen, 2011). It is also possible that single particle cryo-EM could be used for direct phasing as previously demonstrated where a low-resolution single particle map was used to phase X-ray diffraction data (Speir et al., 1995; Dodson, 2001; Xiong, 2008). Moreover, a double tilt cryo holder as well as newly developed goniometer-based grid holders could be used to cover more of the Fourier space. Finally this method could benefit from automation in data collection. This first study serves as a proof of principle that three-dimensional electron diffraction can yield an accurate protein structure from microcrystals. As additional protocols and programs are developed, MicroED promises to advance the field of structural biology and open the door to many exciting new studies. Lysozyme was purchased from Fisher Scientific and a 200 mg/ml solution was prepared in 50 mM sodium acetate pH 4.5. Lysozyme solution was mixed 1 to 1 with precipitant solution (3.5M sodium chloride; 15% PEG 5,000; 50 mM sodium acetate pH 4.5) and crystals were grown by the hanging drop method. Following the crystal formation, the sample was diluted three to five times in 5% PEG 200. A 5 μl drop of the crystal solution was applied to a quantifoil 2/2 holey-carbon copper EM grid. The grid was then blotted and vitrified by plunging into liquid ethane using a Vitrobot Mark IV (FEI). The frozen-hydrated grid was loaded onto a Gatan 626 cryo-holder and transferred to a cryo-TEM. All electron microscopy was performed on a FEI Tecnai F20 TEM equipped with a field emission electron source (FEG) and operating at 200 kV. Electron diffraction pattern tilt series data were recorded with a bottom mount TVIPS F416 4 k × 4 k CMOS camera with pixel size 15.6 μm using built in series exposure mode. The electron dose was kept below 0.01 e−/Å2 per second, and each frame of a data set was taken with an exposure time of up to 10 s per frame. The electron dosage was calibrated with the use of a Faraday cage as well as by calibrating the counts on the CMOS detector in bright field mode. Each data set consisted of up to 90 still frames taken at 0.1–1° intervals with a maximum total dose of ∼9e−/Å2 per crystal. The camera length was optimized for the desired resolution as described previously (Gonen, 2013). Although our original intent was to perform all data analysis with existing X-ray crystallography software various incompatibilities and logistical roadblocks necessitated the development of some additional tools. Diffraction patterns were indexed and background subtracted intensities extracted and merged with in-house developed software implemented in python using methods adapted from those developed by Shi et al. (1998). Briefly, measurements were made on images identified as major planes of the crystal with ImageJ and used to determine the approximate magnitudes of the unit cell vectors a*, b*, and c* and the angles between them (α, β, and γ). Subsequently, 100 to 350 spots were chosen across several images from each set of diffraction patterns. Vectors in reciprocal space were calculated for all of the selected spots. Difference vectors between spot vectors were calculated allowing vectors approximating the estimated unit cell lengths to be identified. The angles between potential unit cell vectors were calculated and ‘orthogonal triplets’ identified. Orthogonal triplets are defined as sets of vectors that contain a predicted a*, b*, and c*, which are all 90° from each other (α = β = γ = 90° for this crystal). All sets of the orthogonal triplets were averaged to yield estimated a*, b*, and c* vectors. The estimated a*, b*, and c* vectors were then refined by identifying parallel difference vectors derived from the original selected spots with lengths that were multiples of the unit cell lengths. where v is any set of Miller indices. For any h, k, l that satisfied the above equation, within a defined threshold, that particular reflection was predicted to appear on the diffraction image, and its x, y detector coordinates on the diffraction pattern image were calculated. Intensities for each predicted reflection were integrated by first drawing both a square and a circular mask centered on the reflection, with the diameter of the circle identical to the length of the square. The mean pixel intensity outside the circle but within the square was calculated yielding the mean background intensity. The mean background was then subtracted from each pixel within the circle, and the resulting pixel intensities were summed. All related intensities from three data sets were grouped based on P422 symmetry. The maximum value for each group of equivalent reflections was assumed to best approximate the full intensity and was used for that reflection in the final data set. Because each intensity measurement ultimately originated from a single observation, SigI and SigF values were estimated as the square root of the intensity and square root of the structure factor, respectively. The final mtz file contains columns h, k, l, F, SIGF, I, SIGI. The final data set contained 2490 unique reflections from 2.9–20 Å with cumulative completeness of 92% (Table 1). Phaser (McCoy et al., 2007) was used to obtain phases with lysozyme structure 4AXT (Cipriani et al., 2012) as a MR search model (LLG = 372 and TFZ = 14.7). The structure was then refined using CNS (Brünger et al., 1998) and PHENIX (Adams et al., 2010) by rounds of rigid body, simulated annealing, and B-factor refinement. The Rfree data set represented 10% of the total data set. The data were subjected to twinning analysis; however, twinning with this symmetry group is forbidden and therefore we ruled out twinning in our crystals. Electron scattering factors (Gonen et al., 2005) were used during refinement. The structure factors and coordinates of the final model were deposited in the Protein Data Bank with accession code 3J4G. The in house developed program that was used for processing the MicroED data is available for download at http://www.github.com/gonenlab/microED.git. Acta Crystallogr D Biol Crystallogr 66:213–221. Acta Crystallogr D Biol Crystallogr 54:905–921. Acta Crystallogr D Biol Crystallogr 68:1393–1399. Acta Crystallogr D Biol Crystallogr 57:1405–1409. Phys Rev E Stat Nonlin Soft Matter Phys 84:011916. Nato Sci Ser Ii Math 245:41–51. Acta Crystallogr D Biol Crystallogr 64:158–166. Acta Crystallogr D Biol Crystallogr 69:1223–1230. Acta Crystallogr D Biol Crystallogr 57:1119–1126. Angew Chem Int Ed Engl 52:8463–8466. Acta Crystallogr D Biol Crystallogr 64:76–82. Thank you for sending your work entitled “Three-dimensional electron crystallography of protein microcrystals” for consideration at eLife. Your article has been favorably evaluated by a Senior editor and 3 reviewers. The following individuals responsible for the peer review of your submission have agreed to reveal their identity: Stephen Harrison (guest Reviewing editor), Richard Henderson, and Axel Brunger (peer reviewers). The guest Reviewing editor and the other reviewers discussed their comments before we reached this decision, and the guest Reviewing editor has assembled the following comments to help you prepare a revised submission. This is an interesting paper reporting a successful, 2.9Å resolution, electron crystallographic study of tetragonal lysozyme crystals. It must be viewed in the context of the publication 50 years ago of the 6Å X-ray structure of the same tetragonal lysozyme crystals (Blake et al., Nature, 1962), the 2Å structure 3 years later (Blake et al., Nature, 1965) and the 0.94Å structure in 2001, which is cited in the present paper. Lysozyme has been a prototype for testing out new methods and approaches ever since Roberto Poljak crystallized it in the 1950s. It has also been studied recently by electron diffraction and imaging (Nederhof et al., Acta Cryst D69, 1223-1230 (2013); Nederhof et al., Acta Cryst D69, 852-859 (2013)). It would be helpful if the authors of the current paper cited the above publications. There is also Moukhametzianov et al., Acta Cryst D, 64, 158-166 (2008) who collected a full 3D 1.5Å resolution dataset from very small microcrystals of xylanase using an X-ray microfocus beam. 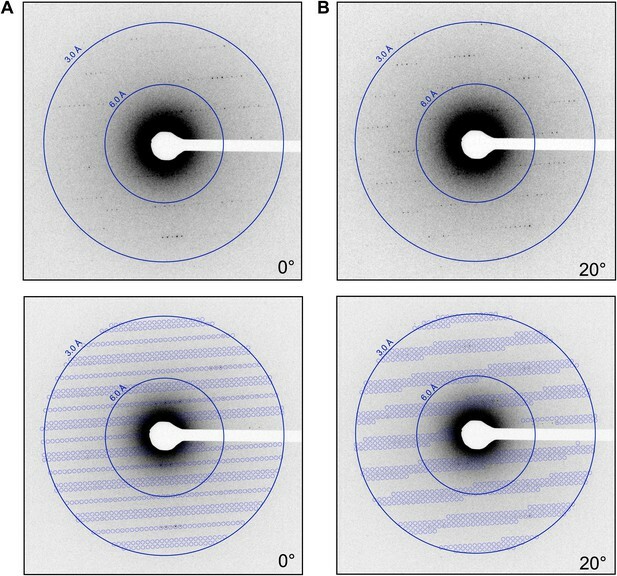 Although the authors have done well to navigate all the technical hurdles that have so far prevented anyone else from collecting a full set of 3D electron diffraction data, it is still not clear whether there is any practical advantage in using electrons over conventional X-rays for 3D crystals. As Moukhametzianov et al., showed, there is also less radiation damage in X-ray crystallography when the crystals get very small because the secondary photoelectrons that are emitted when an X-ray is adsorbed can escape without depositing all their energy inside the crystal. The central background of inelastically scattered electrons in the electron diffraction patterns the present authors show is quite high. This high background could be greatly improved by using a zero-loss energy filter to remove these electrons. The paper should discuss the issue of damage, include some damage statistics from the present work (see item 2 in the revision requests, below), and mention the longer-term value of using a zero-loss energy filter. The authors have also used a very crude way to measure intensities, simply taking the highest intensity of each peak in the rotation series. This would be greatly improved if the now fully established method of profile fitting that is used by the X-ray crystallographers and the methods for correcting partial reflection suggested below were implemented. (See changes in Abstract requested below.) If the work could be repeated with zero-loss energy filtering, a better detector, plus proper estimation of intensities, we might then be in a better position to see how successful the technique is, and what potential it has. Nevertheless, this is a useful step along the way. We recommend two changes in the Abstract. 1) Change the first sentence to: “We demonstrate that it is feasible to determine high-resolution proteins structures by electron crystallography of three-dimensional crystal in an electron cryo-microscope (CryoEM).” The current first sentence is a trace misleading, because the study is really a demonstration of feasibility rather than a de novo structure determination. 2) Change the last sentence to: “This proof of principle paves the way for the implementation of a new technique that may have wide applicability in structural biology”. The following substantive points should be addressed in a revision. 1) Specify the significance of the MR solution (TFZ and LLG). A 2Fo-Fc map should be shown after MR in order to assess the quality of the MR phases. Moreover, a “omit” refinement should be performed with a small fragment of the protein omitted (< ∼10%) and a difference map of that omitted region calculated in order to assess the potential model bias of the maps. 2) Plot a quantity related to radiation damage (for example, the average diffraction intensity) as a function of dose for each subsequent shot for the three crystals used for the final data set. 3) Figure 2A: Is the diffraction limit of the crystals related to size? In other words, is the useful limit related to the number of electrons per Bragg peak? 4) There is an XFEL lysozyme structure available to higher resolution (to dmin = 1.9) (Boutet et al., Science 2012) with comparable crystal size (less than 1 micrometer by 1 micrometer by 3 micrometers). This perhaps suggests that low-dose electron diffraction data collection is ultimately limited by radiation damage or the number of electrons per Bragg peak, in contrast to XFELs where radiation damage is circumvented, even at high-photon flux. The authors should comment on this. 5) Did the authors try a standard indexing programs used in X-ray crystallography? It is curious why a new indexing program was developed. 6) Taking the maximum intensity among the set of equivalent reflection in order to approximate the fully recorded refection is a very crude approximation that depends on the chance of recording approximately fully recorded reflections. This chance in turn is related to the energy bandwidth of the electron beam, the crystal mosacity, crystal and detector parameters, and crystal size (for very small crystals). A discussion of these factors and parameters for this particular experiment would be useful. 7) The “blind” test cases either did not lead to a MR solution or they would not allow refinement. Please specify details: did some of the blind tests produce an MR solution, but refinement was stuck at high Rfree? 8) The observation of non-zero intensities for systematic extinctions is interesting. The explanation by dynamic scattering is possible, although could there be other possibilities, e.g., due to small crystal size? 9) In the Introduction the authors commented on XFELs: the large sample requirement is a limitation of current delivery methods and data analysis (i.e., without post-refinement), not due to XFELs per se. However, the comment on the limited availability of beam time is well taken. In this respect, the low-dose method presented by the authors could be an important staging method for XFEL experiments, and the combination of both experiments could be very powerful. The significance of the MR solution is indicated in the methods section and a new figure was added showing the 2Fo-Fc map after MR and a composite omit map (5% omit) (Figure 6). These maps are also discussed in the revised text. For each crystal that was used, we planned to plot average intensity versus dose at the resolution shell of 3-4Å. However, once we began the analysis we found that the large number of partial intensities made it difficult to accurately track any individual spot over a complete data set of up to 90 frames. We therefore performed an additional experiment to quantify the effect of dose on spot intensities. Diffraction data was collected from a single lysozyme microcrystal using a dose of 0.1e-/Å2 per frame. 120 frames were collected without tilting the crystal for a total accumulated dose of ∼12e-/Å2. In this way we could follow individual reflections throughout all frames and plotted the intensity values versus accumulated dose. This new data is presented as Figure 3 and discussed in the revised text. We found that the diffraction intensity is not adversely affected until the accumulated dose reaches a “critical” value of ∼9e-/Å2. We do not believe this is the case as even crystals significantly smaller than those used here contain more than enough unit cells to get strong Bragg peaks. We updated the text to reflect this point more clearly. A major limitation that we observed is likely because of inelastic scattering in thick crystals. We believe that we are not limited by the number of electrons per Bragg peak but instead inelastic scattering from crystals that are too thick is severely limiting the data. In this revised version of our manuscript we added data demonstrating that the achievable resolution is affected by crystal thickness. These are presented in Figure 2A and 2D and described in the revised text. We note that data in our study was collected to 1.7Å resolution but that the structure was determined to 2.9Å resolution. This resolution cut off is self imposed based on our current software limitations. As such we note that the resolution collected here is comparable to the study by Boutet et al. Science 2013. We updated the manuscript at various places (including the Abstract) to make this clearer. We apologize for the confusion and for not making this point clearer in the original version of our manuscript. We did initially attempt to use MOSFLM to process our data but were met with several roadblocks that, although not insurmountable, made it more practical to develop some basic programs of our own for this initial proof of principal. We still believe that one of the future improvements of this work will be its integration into current data processing software used in X-ray crystallography. Text was added to the Discussion and Methods sections highlighting this point. We added additional text to the Discussion to highlight these points and suggested how some future improvements to data collection may improve the accuracy of the measured intensities. Table 2 was added to provide this information. We do not believe that the crystal size played a role here. Extensive studies from material science describe systematic absences appearing in diffraction patters dominated by dynamic scattering. When precession data was collected these spots were averaged out (For example see references Gemmi and Nicolopoulous, (2007) Ultramicroscopy 107:483-494; Gjonnes et al., (1998) Acta Cryst A 54: 306-319). We added the phrase “the current implementation of this technology” to differentiate that this is, as stated, a limitation of the current delivery methods, and not of the technique itself. The authors wish to thank members of the Gonen lab and Goragot Wisedchaisri for helpful discussions. We also would like to thank Nikolaus Grigorieff (HHMI, Janelia Farm Research Campus) for helpful discussions and suggestions and for critically reading this manuscript. Shane Gonen (JFRC, UW) assisted with the preparation of Video 3. This work is dedicated to the memory of Prof K H Kuo. © 2013, Shi et al. Brent L Nannenga et al. MicroED is a recently developed method that uses electron diffraction for structure determination from very small three-dimensional crystals of biological material. Previously we used a series of still diffraction patterns to determine the structure of lysozyme at 2.9 Å resolution with MicroED (Shi et al., 2013). Here we present the structure of bovine liver catalase determined from a single crystal at 3.2 Å resolution by MicroED. The data were collected by continuous rotation of the sample under constant exposure and were processed and refined using standard programs for X-ray crystallography. The ability of MicroED to determine the structure of bovine liver catalase, a protein that has long resisted atomic analysis by traditional electron crystallography, demonstrates the potential of this method for structure determination. A protein structure has been refined with electron diffraction data obtained by using a very weak electron beam to collect large numbers of diffraction patterns from a few sub-micron-sized three-dimensional crystals.